The MSBA is an association with a rich history, and its ranks are filled with distinguished leaders in the legal profession. Its Past Presidents have been exceptional attorneys and leaders as well as capable stewards for the organization. The current President, Hon. Keith R. Truffer, is focused on the future of the profession, the practice of law, and the vibrancy of this association. He’s leading these efforts via his formation of a Strategic Vision Committee harnessing the feedback of more than three thousand attorneys, a Policy Review Committee focused on ways to best govern the association, and the Legal Assistance Program statewide rollout which allows attorneys access in-person assistance for mental health, addiction or substance abuse concerns across the state, just to name a few. In May 2017, the Board of Governors adopted 25 ‘foundational recommendations’ to better position the MSBA for its future. Significant progress has been made in the 16-months since then. In the last fiscal year, the MSBA published eight authoritative books, with another 12 planned for this fiscal year. This is the most new and revised editions the MSBA has ever produced in such a short period of time. We’ve begun modernizing and refreshing products, overhauled the association’s technology infrastructure to a cloud-based environment, including a new accounting system, association management system, the first iteration of a new mobile friendly website, held focus groups, initiated surveys, and have done a tremendous amount of listening as we concentrate efforts on value, relevance, and addressing the demographic and legal profession challenges being faced. We not only launched a new look, (logo, branding, etc.) but we have begun reaching out to attorneys outside of our typical formats of email, the Bar Bulletin, and the soon-to-be-relaunched Maryland Bar Journal. We have begun new social media and digital efforts, which have already garnered the MSBA more new members this year than we have had in a decade. We have created a new online judicial nomination application system which significantly streamlines that process. We have welcomed the Maryland Access to Justice Commission into the MSBA family. We have added member benefits including a free online CLE worth up to $200 in value if you renew online (something you couldn’t do on your mobile device prior to last year), and so much more. We are leading this organization forward thanks to the efforts of and support of our President, Executive Committee, and Board of Governors. We are clearly in a period of change at the MSBA, necessitated by stark changes in membership trends, and the changing nature of how professionals consume information and derive value from professional associations. There is an entire segment of professionals that wants to engage with us very differently than the generations before them. While we work to enhance our value to our younger segments, we remain focused on remaining a home for the entire profession, including our focus on the nearly one-third of membership that stands at 60-years-old and above. We must properly serve all demographic and practice segments, which means we must begin to do things differently, and also do different things in order to satisfy all. The leadership of the MSBA recognizes the challenges presented by change. I’ve often said that change is messy, disruptive, imperfect and yet, necessary. There has not been a single instance where change has been contemplated that was not met by some number advocating for us to keep things as they have been. We understand that reaction, and work to minimize the level of disruption, while acknowledging that the foundational steps we’re just beginning to take are taken because we need to evolve and be an organization of today and tomorrow. This is my first column for the monthly Bar Bulletin. I’ve had my hands full navigating the landscape and situation we find ourselves in. I’m looking forward to sharing my thoughts each month in this, our Bar Journal, and other outlets. 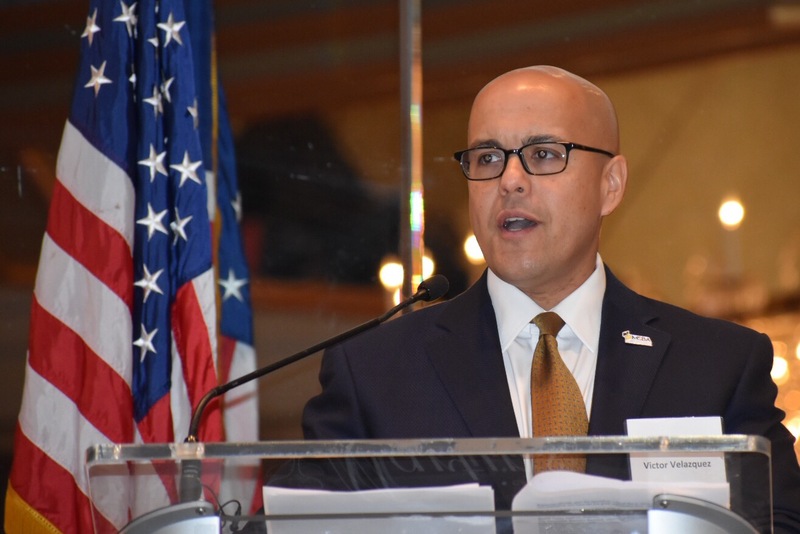 I was recently honored with serving as the keynote speaker at the Maryland Hispanic Bar Association‘s 25th Anniversary Gala. I shared some personal details as I introduced myself to the 250 or so guests, and I focused on two important concepts: Resilience and Connectedness. An abridged version of my comments can be found below. I look forward to getting to know many more of you in the months and years to come. I’m honored to serve as your Executive Director. This evening I’m going to share some other personal details, as I talk about two important concepts in my professional and personal lives, that I hope will help at least one person in this room. The two concepts are (1) resilience and (2) connectedness. There are many forms of resilience. As we sit here this evening, the 7,000 or so who live in Vieques, a little island seven miles off the coast of the main island of Puerto Rico, are living without power – just generators. What we’re seeing in Puerto Rico after thousands of lives lost is an amazing form of a people’s resilience. I’m going to be focusing on individual resilience and the concept of connectedness, or connections, this evening…the concepts that have helped me during periods of change. As for resilience, the textbook definition is the capacity to recover quickly from difficulties. Resilience is that quality that allows some people to be knocked down by life and come back stronger than ever. Rather than letting failure overcome them and drain their resolve, they find a way to rise from the ashes. Psychologists have identified some of the factors that make someone resilient, among them a positive attitude, optimism, the ability to regulate emotions, and the ability to see failure as a form of helpful feedback. Even after misfortune, resilient people are blessed with such an outlook that they are able to change course and soldier on. After an initial surgery to remove the growing tumor, I was given a choice: go straight to chemotherapy, or have another surgery, where they open you up and sample your lymph nodes to see if the cancer has spread. The goal of the surgery, which requires a six-inch incision, is to avoid the need for chemo if the results come up clean. I went to Dr. Foster, a member of Lance Armstrong’s cancer team, in Indianapolis. I had the surgery, and now have a heck of a scar. My results from that surgery came back clean. I could barely walk, but I knew the cancer was gone. Two months later, I went for my first postoperative x-ray, and they found three nodules on my lungs. I was told I had a 30 percent chance of not making it. The cancer had spread. Many surgeries later, chemo, lungs rejecting drugs, months on steroids, I stand before you this evening, three years in remission. Research has shown that while some people seem to come by resilience naturally, these behaviors can also be learned. The circumstances don’t have to be life-threatening. It can be losing a client, losing a case, or any other setback. 1. Find a sense of purpose in your life. After her 13-year-old daughter was killed by a drunk driver who was freshly out of jail on bail for another hit-and-run drunk driving accident, Candace Lightner founded Mothers Against Drunk Driving (MADD). Upset by the driver’s light sentence, Lightner decided to focus her energy on creating awareness of the dangers of drunk driving. In the face of crisis or tragedy, finding a sense of purpose can play an important role in your recovery. This might mean becoming involved in your community, cultivating your spirituality, or participating in activities that are meaningful to you. My purpose was family. I am an important provider for my family, and I knew I needed to be there for them. I had to do everything in my power to beat cancer. Surgeries, trips to the Mayo Clinic, Hopkins, Indy Purdue. I would make sure I did all I could, for my purpose was great: my family. 2. Develop a strong social network. It’s important to have people you can confide in. While simply talking about a situation with a friend or loved one won’t make your troubles go away, it allows you to share your feelings, get support, receive positive feedback, and come up with possible solutions to your problems. Consider the Maryland Hispanic Bar Association and the MSBA. Don’t discount the value of these organizations, and not only in times of professional growth, but also in times of professional challenge or hiccups. For all those not “in the room” tonight, help them to understand why they should be part of what we’re part of, why associations like MHBA and MSBA are important. For yourself, recognize that it takes others to help you succeed, and you succeed when you help others. The Maryland Hispanic Bar’s mission statement includes this as one of its core purposes. 3. Nurture yourself. When you’re stressed, it can be all too easy to neglect your own needs. Losing your appetite, ignoring exercise, and not getting enough sleep are all common reactions to a crisis situation. Focus on building your self-nurturance skills, even when you’re troubled. Make time for activities that you enjoy. By taking care of your own needs, you can boost your overall health and resilience and be better prepared to face life’s challenges. 4. Don’t try to solve problems with the same thinking that created them. Resilient people do not make the same mistake again and again. They’re willing to be honest about why they failed, and they take the time to think about what didn’t work. This is true for individuals and organizations. Bars and associations must adapt and not be constrained by successes and routines of their past as they look to their future. True for an organization, true for each of us. 6. Pick yourself up as many times as it takes. Resilient people understand that failure is not falling down but refusing to get up. They have the capacity to adapt successfully, and the tenacity to never ever quit. 7. Reward the small wins. Resilient people believe in themselves. They work hard and take joy in the small wins that give them strength. 8. Keep giving. Even in the toughest of times, resilient people find a way to care for others, because sometimes being selfless is the best way to discover your own strength. Making it through tough times takes resilience. It requires that we pay attention to the complexities of our own experiences, listen to our emotions, and be willing to learn from disappointment and failure as well as success and motivation. So, resilience is an essential concept, in my opinion. The attitude. The approach. The state of mind. The second concept I’ll share this evening is connectedness, or your connections. That little boy who couldn’t relate to those around him because of a language barrier needed to develop his connectedness; that’s still a work in progress for me, by the way. For those of you familiar with StrengthsFinder, those with connectedness as a strength have the unique ability to “connect the dots” between what is happening in the here and now with deep personal meaning. People with the strength of connectedness have a unique way of seeing events, people, and the world; they are able to recognize instinctively that everything that happens is caused by something else. There is a “ripple” that connects people and events together. People with connectedness often feel personal responsibility to the connections they make. In fact, they might find themselves becoming more and more connected to something over time, making change or disconnection very challenging. The person with connectedness can build a bridge of understanding, and weave connections of meaning that others can understand. People with connectedness see events, interpersonal interactions, and emotional elements all coming together to create a beautiful picture that would never be formed alone. They are often weavers of compelling and dynamic stories. I find myself attempting to weave a story for our MSBA – conveying the strengths of our past while not constraining us in terms of needed evolution as we position ourselves for the future. I believe the two simple yet powerful concepts of resilience and connectedness have been critical for me and could be helpful to many others as they traverse their professional and personal journeys. You know, a few months after I said those first words in that class – “I don’t speak English” – I had mastered the language enough to tell my very first joke…and the kids laughed. It was at that very moment that I began my journey connecting with others. To be part of a tribe. An association of those important to me. Not unlike what the MSBA is for nearly 24,000 attorneys – their connection to the profession. Attorneys take many paths in the professional journey, but there is only one home of the profession, the MSBA. Little did I realize that, 40 years or so later, I would be sharing this story with you. I hope that you think about the eight suggestions for resilience in your own lives that have helped me in mine and the role of connections. Because that little boy from Carolina who didn’t speak English now views resilience and connectedness to others as key to his success.